Panelists Dan Cronin, Toni Preckwinkle, Melissa Washington, Raul Raymundo, Laurence Msall, and Leanna Redden discuss the new plan with ABC7 anchor Judy Hsu. On the morning of Wednesday, October 10, the Chicago Metropolitan Agency for Planning (CMAP) board voted to adopt a new regional plan for Chicagoland. At an event attended by over 1,000 of the region’s political leaders and planners, the executive director of CMAP, Joseph C. Szabo, presented the three principles of the new plan: Inclusive Growth, Resilience, and Prioritized Investment. These three principles are applied to each of the issue areas the plan addresses: Community, Prosperity, Environment, Governance, and Mobility. The issue with the most forward discussion at the plan launch was transportation. Speakers stressed the importance of supporting transit and expanding it to underserved communities to provide access to jobs and leverage the growth of the region’s economy. Another big topic was resilience to natural disasters as climate change makes storm events more severe and exacerbates flooding in certain areas of the region. Overall, the change in tone was noticeable regarding social matters compared to the Go To 2040 plan. 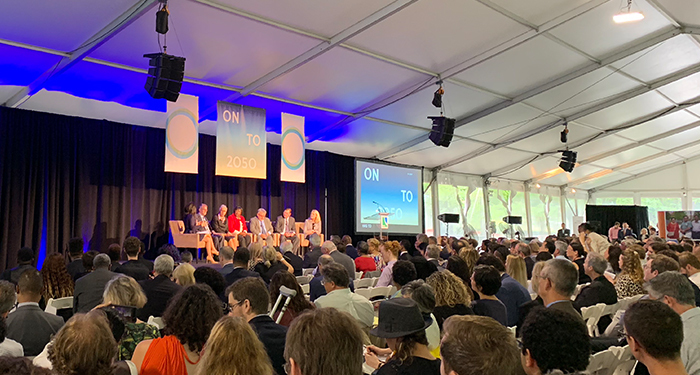 The 2050 plan itself, and speakers at Wednesday’s event, stressed the importance of inclusivity in the region and ensuring an economy, education system, and transportation that will build up and benefit those communities that have been left behind in the past. The On To 2050 plan, though wide in its scope, should prove to be an effective tool for guiding the development of our region for the coming decades.